Makayla Rose has moved to Briney Creek from New York. She’s decided after working as a forensic photographer for the NYPD and loving a man who ended up causing her to be suspected of murder, she needed a drastic change. Makayla opens her little photography studio right on Main Street and is happily shooting scenes of festivals, family annual photos, and some business promotional arrangements. She’s even getting her own glamor shot together so she can create an online profile for a dating site. Unfortunately, the pain and fear of the past comes flooding back when she arrives at her shop to find the body of the local loan officer. 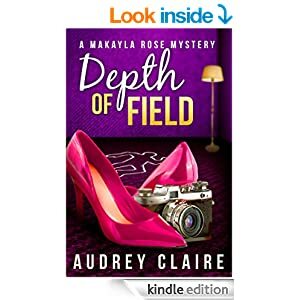 Now Makayla has to figure out who in her idyllic new town is a murderer and if her photos, found dumped all over the body, hold the clue. Found on the Kindle Store as a free download, the cover intrigued me and I was looking for a new cozy mystery. Claire does not disappoint! She has a way of bringing new depth to characters as as to not make them drippy or one-dimensional. Makayla (how lovely and unique is that name?) is a fully whole character with a past that is believable and a present that anyone can identify as themselves or best friend/next door neighbor. All the characters Claire creates have both positive and negative attributes, from Talia the older upstairs neighbor who blasts 80’s workout music at all hours to the small downtown business core owners who are more interesting than a small town atmosphere warrants. The Sheriff, Spencer, is like a who’s-who of big, hunky lawmen, over six foot, dark hair and silver smoldering eyes. But this isn’t a sappy romance novel, or by-the-numbers cuteNcozy. No, there are serious issues raised and Claire does a wonderful job creating a world where bad guys are next door neighbors and unsuspecting killers. I loved this first book so much, I bought the next two immediately at bargain prices. I will definitely keep my eyes open for more of Claire’s books.